Tips for staying healthy and making the most of your healthcare insurance coverage. Many people are still not taking advantage of all the benefits that come with having insurance. Yet they have been shown to save lives and improve your chances for a healthy outcome by identifying illnesses earlier so that you can manage them more effectively and treat them before they become more serious conditions. There are a few things to be aware of regarding the free preventive care services offered in most health plans now. You still need to make sure the doctor or other provider is in your plan’s network; or face additional costs. Make sure you’re clear that you want a “wellness visit” – if you go in with a specific complaint or illness, your doctor will most likely code it differently and again you may face additional costs since the primary reason for your visit wouldn’t be for preventive care. Be aware of how often you can use any one type of free preventive service. If the free screenings show the need for follow up treatment – those additional appointments and/or services will not be free. Your insurance provider may see things differently than you do. For example, a preventive colonoscopy might have been deemed “free preventive” – but the accompanying anesthesia was not. Or your insurance company may only offer one type of service or drug as “free preventive” if there are a number of alternatives. So be clear about your understanding and intentions. Ask your doctor for general advice on what services are included as “free preventive” and also call your insurance company directly. To see a comprehensive list of all categories, click here to view the U.S. Department of Health & Human Services fact sheet for preventive services covered under the Affordable Care Act; or click here for additional details. And for a more detailed look at the cost barriers to using preventive services, categories of services offered, coverage rules and implementation challenges; read more at this KFF fact sheet provided by The Henry J. Kaiser Family Foundation. Health is more than healthcare insurance. Use your free wellness visit and other free preventative care services to stay informed and take action for your personal health. If you’re a smoker, you can save money and improve your health by quitting today! Take charge of your own health with other lifestyle changes such as healthier eating and putting a few more steps into your day. There are still way too many people left without medical insurance. Some are among the poorest who are caught in the NC Medicaid Gap and do not qualify for any financial help. Others just can’t afford to buy insurance (even with subsidies.) We’ve listed some of the free and sliding-scale options in your county here. Thanks to the Affordable Care Act, insurance companies can no longer charge women and men different prices for the same plan. Nor can they increase your premiums due to current health or medical history. All health plans must cover treatment for pre-existing conditions from the day coverage starts. However insurers can charge tobacco users more; which puts insurance out of the reach of many of the lowest income people. The tobacco surcharge is applied as a percentage of the cost of health insurance before advance premium tax credits are applied. While insurers are allowed to charge up to 50% more; we’re seeing lower percentages than that in Western North Carolina. These vary by insurance provider and by the age of the applicant. The economic and health costs associated with smoking continue to rise. Quitting smoking is hard. Research shows that nicotine may be as addictive as heroin, cocaine, or alcohol. Most adult smokers have tried to quit and many have given up hope. But it’s never too late to quit! 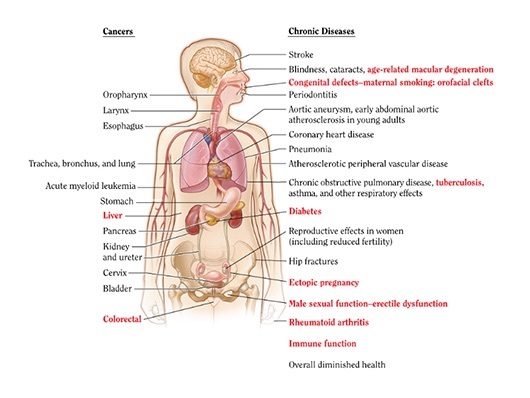 Smoking harms nearly every organ of the body, as shown by the graphic below from the CDC. Get more information here on the Health Effects of Cigarette Smoking. The sooner you quit, the sooner your body can begin to heal. Click here to view a quick slide show about the affects of quitting – from 20 minutes after stopping to 15 years after. Find a buddy and use these Quit Tips to spur each other towards better health (and lower insurance costs!) 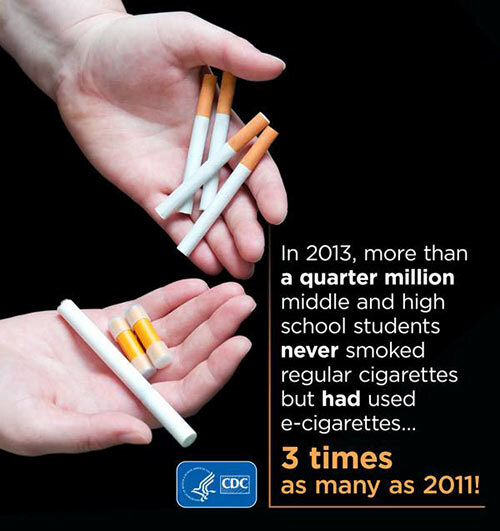 Even more Quit Smoking Resources can be found here. If you can stop smoking between now and June 15, 2016, you could qualify for low cost insurance without any more tobacco surcharges by the Dec 15th deadline for coverage to start Jan 1, 2017. 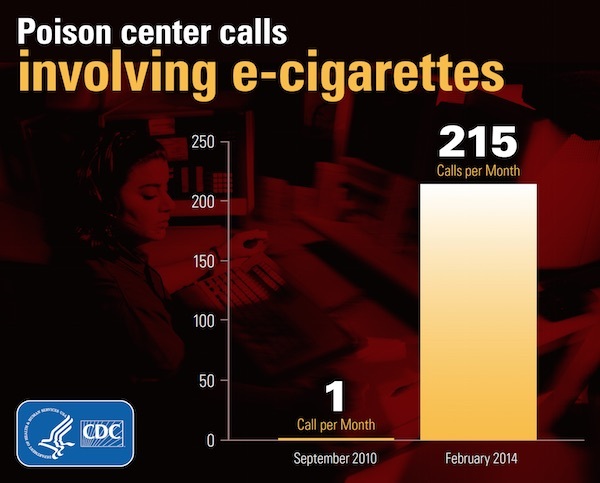 And remember, e-cigs are often included as “tobacco” products by many insurance providers when adding the surcharge. This is one of the simplest lifestyle changes, but not always the easiest. Most everyone would agree on general ideas of what foods are healthy, and which are unhealthy. Everyone’s diet is unique and there’s no “one type fits all” approach. The important thing is to act on your intent to eat in a healthy manner and experiment to see what that means for you. Stress is a big factor in many of our unhealthy habits – from emotional eating to not having enough time in the day to prepare nutritious meals. Anything you can do to increase a relaxation response versus a stress response will go a long way in supporting all of your health goals. This could be as simple as taking a deep breath and stepping away from the stressful situation, to meditation and mindfulness practices. Another lifestyle change that most everyone would agree on is that we need to move more. How? and when do we have the time! are common responses to explain why we aren’t as active as we’d like. Extreme changes in physical activity can also lead to health problems (as many weekend warriors have discovered when overdoing it on their days off.) Just remember that variety is the spice of life and begin to experiment more with small sustainable changes. Look for “Simple Opportunities For Action” (SOFA) whenever you catch yourself being a couch potato. Expand that approach to your commute, your work day, and your evenings at home. The more you do, the more you’ll be able to do – as long as you don’t overdo! Sleep deprivation is rampant in our country. Especially for those who are working 2nd (and 3rd) jobs to make ends meet. The lack of sleep almost all new parents face can continue as more and more demands are placed on both them and their children. Surviving on less than 6 hours sleep a night has become a matter of pride for many busy people who may not realize the hidden toll it’s taking on their bodies. Adequate sleep (8-9 hours is now being recommended) provides a huge boost to our health – from physical repair of our bodies to clearing of our brains. Whether it’s an improved diet, more activity, adequate sleep to allow your body and mind to replenish themselves, or something other than the “big 3” – we all have a pretty good idea of where to begin. Find a buddy and support each other in implementing your goals towards a healthier you.